Discarded clothing comprises such a huge amount of landfill space that in the past couple of years, local governments have begun curbside pickup programs for used textiles. Meanwhile, clothing retailers like H&M and North Face encourage customers to trade in used clothing for discounts. H&M provides 15 percent off of an item of choice in exchange for used clothes. These trends highlight the ever-growing concern of textile waste, which now accounts for 5 percent of all municipal waste, says the U.S. Environmental Protection Agency. It is estimated that the average American throws away 70 pounds of clothing or textiles per year, with only 15 percent of all textiles being recycled. Billions of pounds of textile fabric wind up in landfills each year, all of them with the potential to contaminate the soil if buried, or release greenhouse gases if burned. Part of the problem is that the vast majority of Americans mistakenly think that stained or torn clothing cannot be used. In fact, statistics show that approximately 99 percent of clothing thrown away could be recycled. If donated to charities, these seemingly useless textiles will eventually wind up as insulation, upholstery stuffing, or even U.S. currency: yes, the dollar bill in your pocket may contain fabric from recycled clothing. But the environmental benefits are not the only reason to recycle and donate clothing—it makes good reconomic sense as well. Used clothes are comparably far cheaper, and U.S. textile recycling is a 700 million dollar industry that has produced over 17,000 jobs. 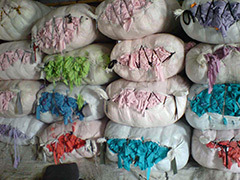 The EPA estimates that taxpayers are wasting over a billion dollars a year by sending their textile waste to landfills. Textile recycling is a great way to contribute to the betterment of both the environment and the economy. To find local bins and outlets for recycling, visit planetaid.organd earth911.com. Posted on February 12th under Pollution Reduction.